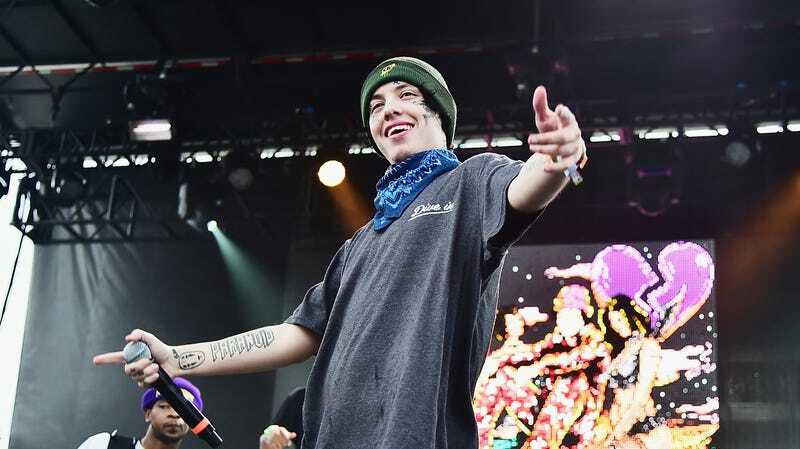 For many of us, Lil Xan is like an auditory mugging: It’s rare to encounter, but when you do, it kind of inevitably fucks up your day. The 22-year-old, heavily face-tattooed rapper remains incredibly popular among the Soundcloud set, and even occasionally manages a charting single, but it’s rare for his existence to bring something approaching real joy into our lives. Stereogum reports that Xan was in the hospital today, but not for, like, a depressing reason. (Depending on your definitions, at least.) In fact, the rapper was forced to seek medical attention after taking too much of a notably dangerous and easily abused substance: Flamin’ Hot Cheetos. Yes, like so many of us, Lil Xan fell victim to the siren song of burning cheesy goodness which, as at least one doctor has noted in the past, “burns when it goes down, it burns when it comes out.” And also burns on the inside, apparently, with Xan reporting that he “ripped something in my stomach open a little bit and I puked a little blood” as a consequence of eating too many of the little nuggets of exquisite pain. Jesus! It’s all good, though: Xan noted on Instagram that he’s “Healthier than he’s ever been”—again, give or take some sort of junk food-induced stomach ulcer—and is ready to head back out on tour.